Three new, totally different, pig piggy banks in my collection. From France a piggy of Faïence de Desvres (Nord Pas de Calais) produced by Manufacture Gabriel Fourmaintraux (GF).In the autumn of 2014 I bought another one at the EMBC Convention in Stuttgart. 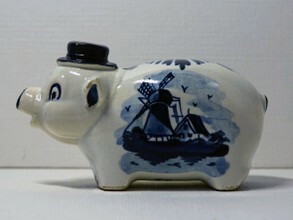 The ‘new’ one is older (± 1930), with a fisherman painted on it. The other one is dated ±1950 and decorated with a farmer. 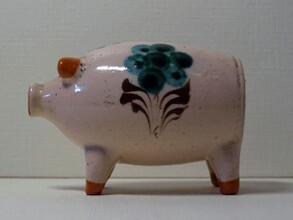 From The Netherlands (I’m pretty sure, but one is never certain when it comes to indentifying the producer or producing country without hallmarks) a piggy from a series. Series in a collection is something special, You buy one, than a new one sometimes years apart and the discover you have a series. To buy a complete series of piggy banks is practically impossible, unless you are very lucky. 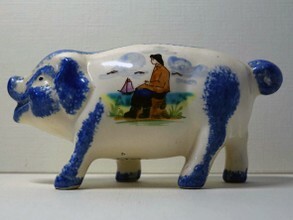 To show you absolutely kitsch I bought this (how awful it may be, it is special) Delft Ware piggy, painted with the traditional mill.